“Fashion design is what I was born to do. 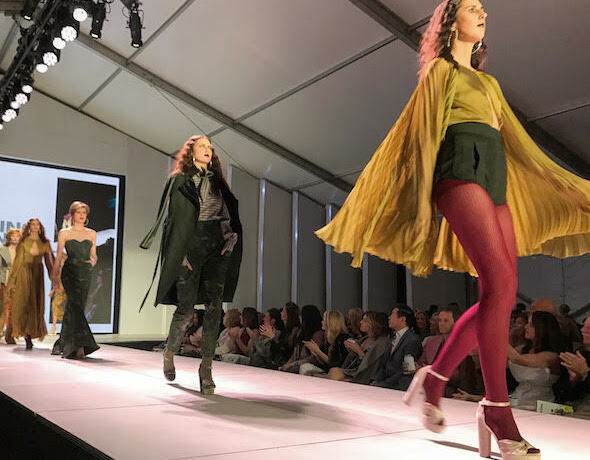 It’s a God-given talent that feeds my soul, and I hope that it shines through in my work,” says emerging designer Joan Madison. Madison started working at a fabric store when she was 13. 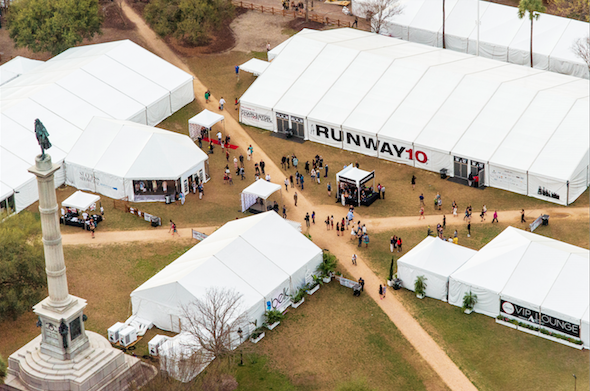 She gained experience in patternmaking while working for Ellen Tracy and Liz Claiborne, and she also worked as a technical designer for Ann Taylor. Currently, Madison owns her own bridal shop, Joan’s Bridal Couture, in Columbus, Ohio. 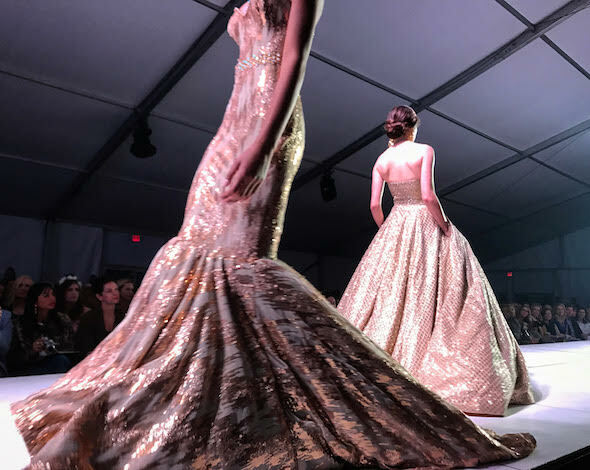 Her collection focused on a metallic color palette with intricate details and structure. 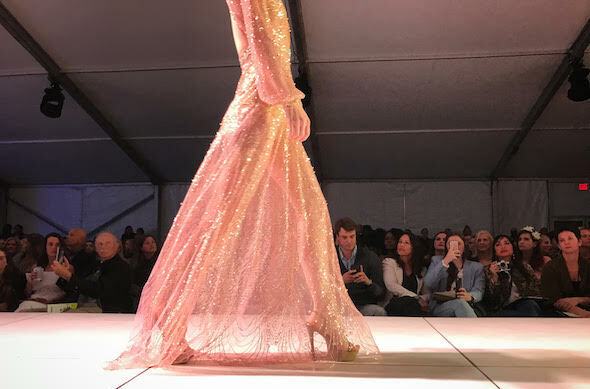 She used delicate lace and tulle materials, contrasted by brocade-like fabric on her skirts, sleeves, and necklines, that created a collection full of dramatic, red carpet looks that literally shined as her models walked the runway. Sharae Hines brought her love of 1950s inspiration with classic silhouettes as a nod to women’s empowerment that transcends any time period. 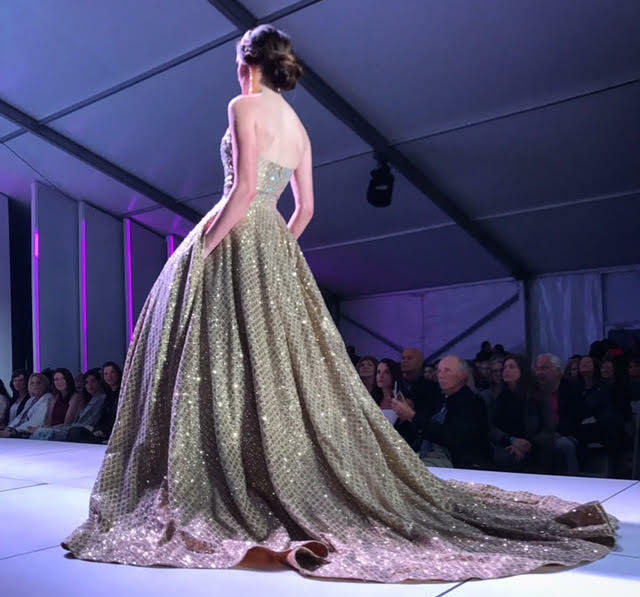 Hines has worked as an assistant textile designer for Belk but currently focuses on her women’s eveningwear, which she showed at Charleston Fashion Week. Many of Hine’s designers were a literal take on historical 1950s fashion—right down to the hair and makeup. 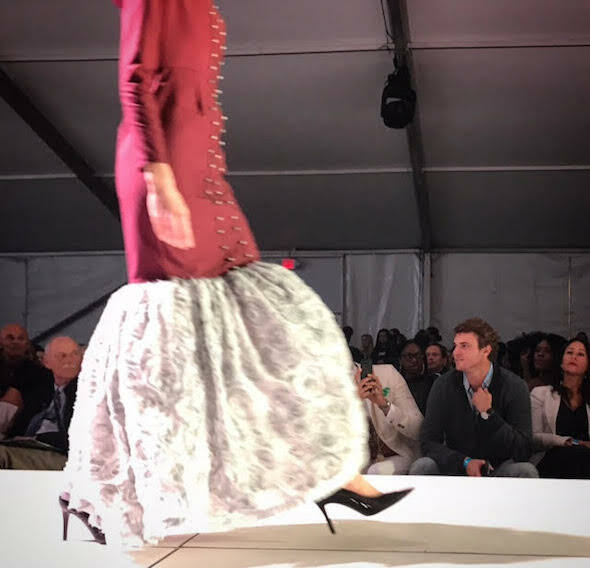 Her collection included double buttons featured on both dresses and coats, silhouettes pulled in at the waist with a full skirt, and mermaid skirts. 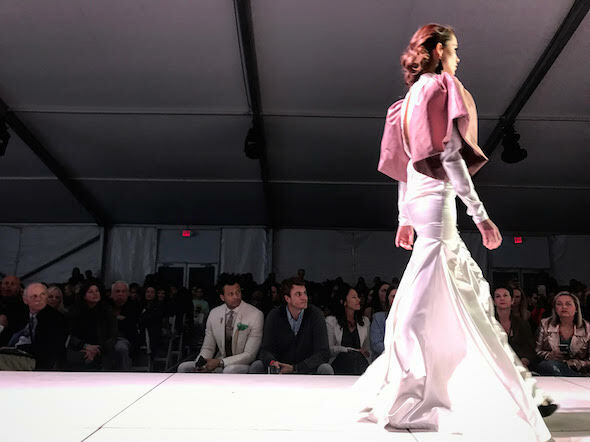 Her color palette also felt vintage with maroon, soft pink, and light blue hues. 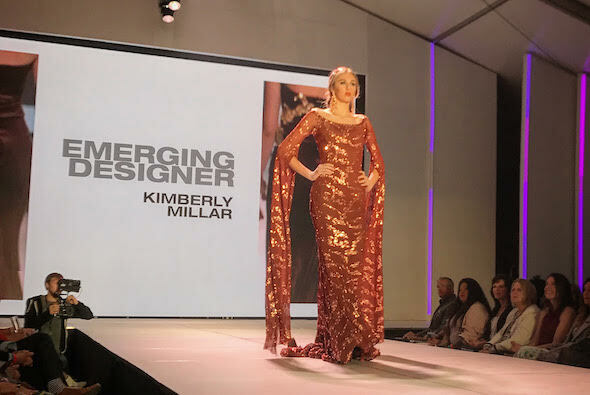 “Byzantine meditation” is the key phrase used by Kimberly Millar to describe her collection for Charleston Fashion Week. Specifically, she’s inspired by 6th century Byzantine Empress Theodora as an example of beauty and power. With a very specific aesthetic, Millar designed her own bridal gown when she could not find anything that she felt represented her style. From Charlotte, NC, Millar goes by Pixton Design Group as her label. Her designs felt very goddess-like, which seemed to be the goal of Millar’s garments. Her color palette focused on metallic shades and rich, warm tones. This was echoed in her fabric choices, which spanned from soft velvet-like material to thin sequined fabric. 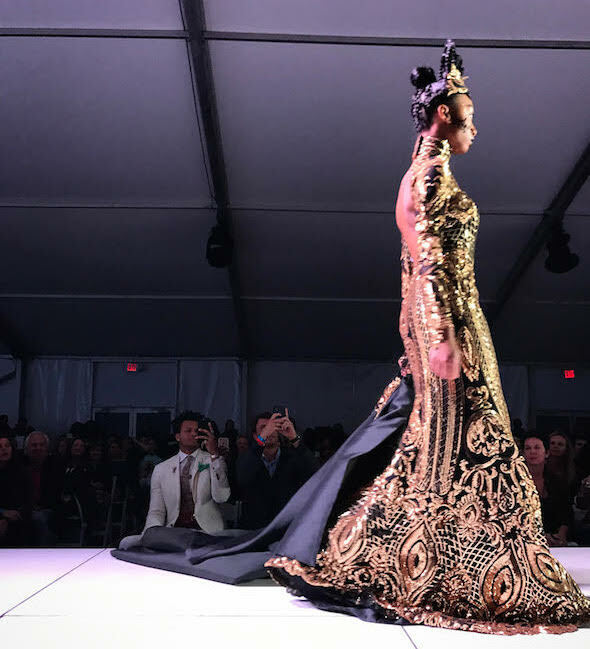 Overall, Millar personified decadence and luxury portrayed in historical Byzantine art and culture, while making her collection feel like modern eveningwear. 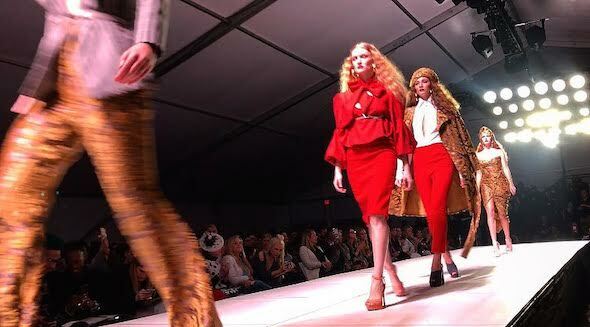 A finalist on Season 16 of Project Runway, Kenya Freeman wowed us with 70s romance that felt fresh. 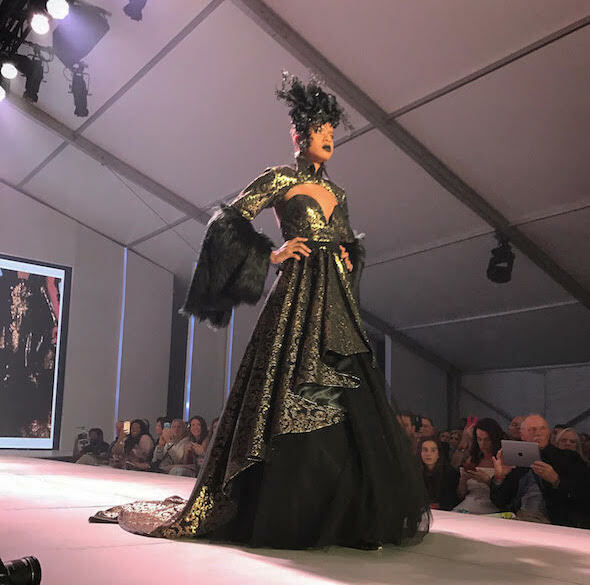 The Atlanta native was the only designer to show a ready-to-wear collection featuring separate garments and complete looks. Her collection featured a wide range of colors, patterns, and textures, much like the overall aesthetic of the 70s era. Her opening look featured flowing silk with simple colored tights and shorts. Her collection closed out the night and felt like a satisfying juxtaposition of pieces you could wear straight from the runway.